Lead generation is the act of identifying and attracting qualified prospects, then building them into paying customers. There’s an important word in that sentence: QUALIFIED. For a person to be a true “lead,” they need to have indicated an interest in your company somehow. They followed you on Twitter, signed up for your blog posts, or contacted you through your website. They put their business card in a pot to win a company-run lottery. They filled out a survey you created somewhere. Anyway, whoever that company was that called you, called you from one of those lists. How likely are you going to be to 1) listen to the whole phone call and 2) order back brace? Just because someone connects with your business in some way doesn’t necessarily mean they’re a good (or qualified) lead. For example, I have filled out forms to download reports in order to garner the information from those reports for an article. Am I really a qualified lead? No, because I’m not interested in their product, just their research. A qualified lead is someone interested in what you have to sell, whether it’s a product, service or piece of information. Let’s look at a simple step-by-step process. 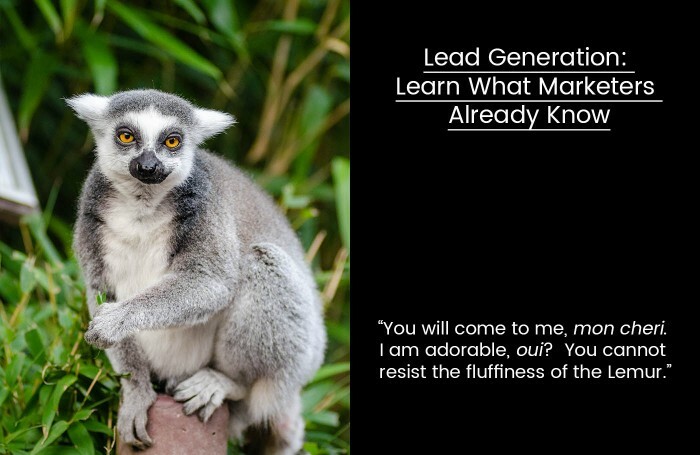 Lead generation is just that – lead generation. It’s not lead management. You have to generate the leads before you can gather their information. The way you gather information about your visitors is by asking for it – i.e. offering up things that entice them to give you their information, even if it’s only a name and email. Think about a brick and mortar business – or how about the last time you went into Target, Dillions or something like that. When you step foot into that store, they don’t know anything about you. It isn’t until you buy and hand them your credit card that they even know your name – and you volunteered that information, yes? We’re looking at the same thing online, only we have more opportunity to entice visitors to volunteer their information. We provide them with reasons to give you that information by offering eBooks, white papers, brochures, newsletters, contact forms, etc. This is where the lead gen comes from. We write an eBook about five common issues that get businesses in trouble with Google and how to avoid them. Create a landing page offering that eBook. The landing page has a form that captures the information we want. Create emails and ad links (for social marketing), advertising that eBook. Launch the emails and ad links. When visitors fill out the form, their information goes into your contact base. That’s the power of the lead generation. Lead generation platforms such as Marketo or Salesforce help make that process much easier. Also, a good lead generation platform should have a strong Customer Relationship Management package, which stretches its usefulness past the customer acquisition stage. Lead generation happens through information collection. However, information collection is a fine line to walk. When you first set up your hook (i.e. lead gen strategy), you should have an idea of the kind of information you need from your target. In almost any industry, there is a specific piece of information unique to your market that decides whether your visitor is qualified or not. For example, if your target market consists of manager and VPs, the qualifying question would be their job title. Don’t ask for more information on your forms than you need to qualify the visitor, but don’t leave the qualifying question off. You need an email address. To make things personal, it’s good to have their name. We’ve already established that it’s necessary to ask their job title. However, it isn’t necessary to ask the company they work for, their employee numbers or the state they live in. The longer a form is, the less likely visitors are to fill it out, so make sure you really need that information. What kind of lead generation strategies really work? I mentioned writing an eBook in the last section, but does it really work? And what are some other strategies that help generate leads? The answer to the first question is, yes. If you have a topic your market is interested in, writing an eBook, guide or whitepaper works every time. It takes tweaking to get better response times, but this strategy does work. The second answer, of course, will take a little bit more time. Stay tuned for our next post, where we’ll cover 10 lead generation strategies that really work.